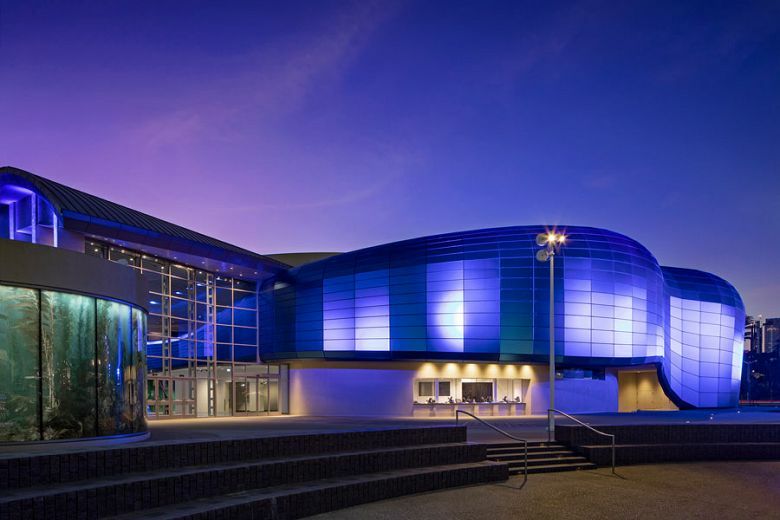 The Aquarium of the Pacific has announced that exterior construction and landscaping are complete for Pacific Visions, its first major expansion, which officially opens May 24, 2019. 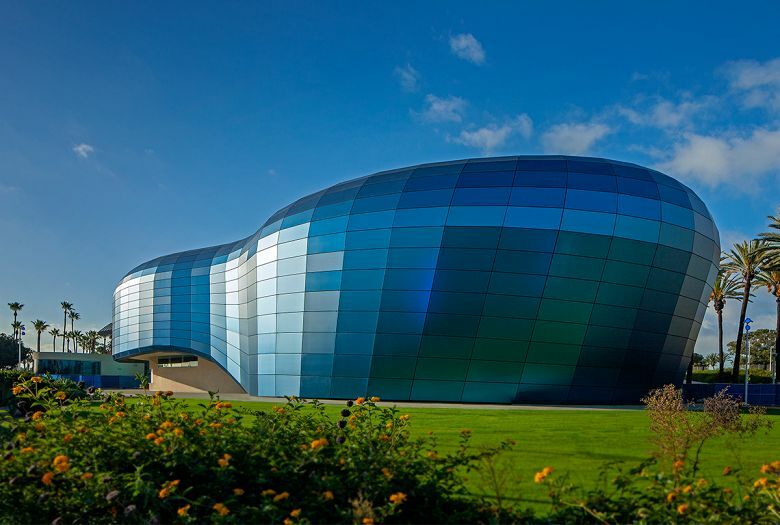 These finishing touches include dramatic nighttime lighting emphasizing the building’s curved façade and striking blue color. The 29,000-square-foot, two-story, sustainable structure, designed by San Francisco-based EHDD and executed by Clark Construction, will house a state-of-the-art theater, exhibition space, art gallery, and animals. Visitors enter Pacific Visions through a 2,800-square-foot art gallery. The inaugural installation designed by Germany-based Convivial Studio immerses visitors in sea life through a multi-channel video installation, spatial soundscapes, and sculptural relief walls. Next,visitors enter a 2,600-square-foot orientation gallery showcasing an interactive virtual waterfall and a film that introduces human impact on the planet and opportunities to turn the tide. 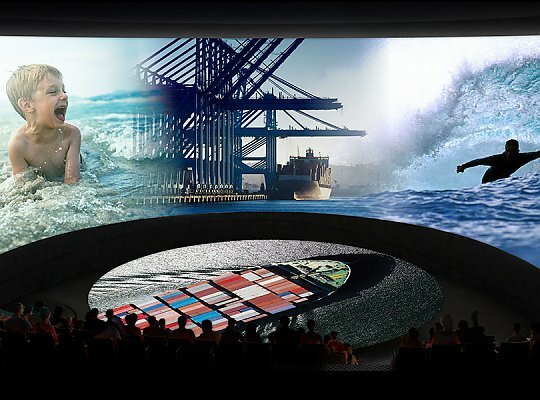 These concepts are explored further in the 300-seat Honda Pacific Visions Theater, which houses a 130-foot-wide by 32-foot-tall screen that curves in a 180-degree arc, a tilting floor projection disc, and special effects capabilities. The Aquarium and Cortina Productions are developing the theater content in partnership with leading scientists, filmmakers, storytellers, and digital artists. In Pacific Vision’s 5,000-square-foot culmination gallery designed by Bowman Change Inc. with Cortina Productions, visitors can envision steps to create a better planet through interactive games, displays, and animal exhibits. An app designed by Artifact Technologies will enable visitors to share their experience. Pacific Visions is supported by the City of Long Beach with a $15 million matching grant, a $5 million matching grant from John, Michelle, Mario, and Therese Molina, and $5 million from American Honda Motor Co., Inc. Private donations and commitments of $1 million or more have been given by James and Marilyn Simons, Dr. Allen and Charlotte Ginsburg, Don Temple Family Charitable Foundation, PREMIER/SMG, Rivers and Mountains Conservancy, and one anonymous donor.